What do you say to the person you entrust to teach and guide your kids every day? What are you most grateful for? Maybe it’s the little things, like how they notify you of your child’s achievements, or how they make themselves available after hours to connect with you about a concern, or the fact that they take the time to share with you something that sparked your kid’s interest in the classroom. Maybe you appreciate all of these things, but have never gotten around to expressing your thanks. This is one instance where choosing just the right words is not the point. A sincerely written thank you note can go a long way to inspire and nourish a great teacher. Start with something simple and to the point: “I noticed that you take the time to encourage great manners in your classroom, and that makes a difference to me. Thank you.” A quick sentence or two about how the teacher has impacted both you and your child will surely be remembered and appreciated–whether it’s teacher appreciation day or not! 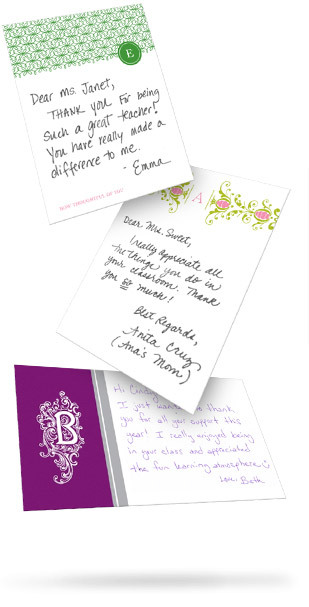 While those other teacher appreciation ideas (you know, the coffee mugs and potted plants) collect dust, most teachers will mention thank you notes or letters they got from students or parents when asked about the best ‘thank you’ they ever received. Knowing they’re making a difference in their students’ lives is what makes most teachers love to teach. Don’t forget to tell them!